The hands-on-access fabrication facility for MEMS at Tohoku University is an open facility for every engineer working to develop MEMS devices. The fab is located at Jun-ichi Nishizawa Memorial Research Center, Tohoku University, and was started in 2010. The operation of the fab is based on open collaboration wherein all persons concerned in MEMS development share the facilities, human resources, technology and know-how to overcome the difficulties in MEMS development. The users of the fab can utilize the fab and operate the equipment by themselves under the technical staff's support. 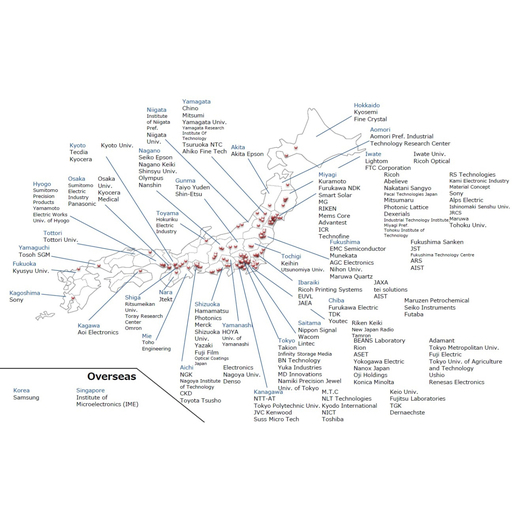 The users also can access accumulated know-how at Tohoku University. Know-how, in particular, the conditions and results of each fabrication process, are shared by the users and the staff. Over 200 companies have utilized the fab for developing various devices, such as an accelerometer, pressure sensor, photodiode, radiation sensor, solar cell, microphone, and micromirror. There have already been several commercialized MEMS devices that have been fully or partly developed at the fab. Simultaneous nurturing of engineers and development of MEMS devices by on-the-job training at the fab effectively contributes to device commercialization. To accelerate the university's research, development, and education, product fabrication by a company user was started in July 2013. Kentaro Totsu, Masaaki Moriyama, Yukio Suzuki, and Masayoshi Esashi, Accelerating MEMS Development by Open Collaboration at Hands-On-Access Fab, Tohoku University, Sens. Mater., Vol. 30, No. 4, 2018, p. 701-711.